After having quite a bit of trouble with hair algae blooms in my reef tank I decided to shop around for a protein skimmer to help alleviate the problem. I noticed a vast array of skimmers, some of which were quite pricey. But most of them were also way too large for my Biocube 29. 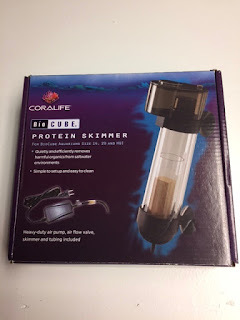 I saw that Coralife had a protein skimmer that was specifically designed for the Coralife Biocube 29 and it was quite affordable at slightly over $29 from Amazon.com. and other online stores. I checked the reviews on this product and they seemed to be mixed, with some saying it was wonderful and others saying it was worthless. Since the other protein skimmers were very expensive and only a very few would fit in a nano tank, such as mine, I went with the Coralife. Upon receipt of the skimmer I quickly noticed that it would easily fit in any one of the back chambers of my Biocube 29. I attached the enclosed wooden air stone and installed it into the 3rd chamber of my tank. I adjusted the airflow to allow an adequate (so I thought) amount of tiny bubbles. A few hours later I noticed a small amount of clear skimmate and emptied the collection cup. Over the course of about 3 weeks, with numerous adjustments, I obtained nothing but clear skimmate. You have to replace the wooden air stone every 30 days at a cost of about $4 or $5 each. After about 3 months of numerous adjustments to the skimmer and obtaining nothing but clear water I surmised that it just didn't work. I figured that if this skimmer really worked and I was to keep it, the cost for the wooden air stones would be at least $48 a year, plus the hassle of having to change them every month. So I decided to do more research and look around for a better and most likely more expensive propeller driven protein skimmer. The cost was right with this skimmer, but it did not work for me.